Antique Furniture Stores are all the rage, all across America. Scroll down for a list of factory outlet malls selling discounted antique furniture and all kinds of other department store merchandise at wholesale prices. This page features a detailed list of factory outlet malls in North Carolina. For outlet malls in other states, see the links below. About Last Nite, located in Hickory (near Charlotte), features 58 factory outlet stores. For store hours, driving directions and other info, call ﻿(828) 324-2830. Adams Furniture in Highpoint (near Greensboro) is a major outlet location for shoppers seeking Antique Furniture Stores. For more info, visit their website. Or call 336-889-0807. Alan Ferguson Associates in Highpoint (near Greensboro) has 47 outlet stores to visit. For a mall map and more info, visit their website. Or call 336-889-3866. American Accents in Jamestown (near Greensboro) has 18 factory outlet stores to explore. For driving directions and other details, call 336-885-1304. Amish Oak and Cherry in Hickory (near Charlotte) has 12 factory outlet stores to sort through. For driving directions and other details, call 828-261-4776. 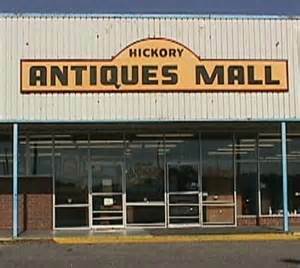 Antiques & Interiors on Main Street in Highpoint (near Greensboro) has 8 outlet stores to visit. For more info, visit their website. Or call 336-884-4084. Antiques & Interiors on Ward Avenue in Highpoint (near Greensboro) also has 8 outlet stores. For more info, visit their website. Or call 336-885-6255. Ashley Interiors in High Point (near Greensboro) has a Braxton Culler outlet store. For more info, call 336-889-7573. Bedroom & Mattress Discounters in High Point (near Greensboro) has 3 outlet stores. Bernhardt Factory Outlet is located in Hickory (near Charlotte). For driving directions and other details, call 828-313-0795. Blowing Rock Tanger Outlets in Blowing Rock (near Charlotte) has25 factory stores to visit. For store hours, mall info, and other pertinent details, call 828-295-4444. Boulevard Bazaar in Charlotte has 5 factory outlet stores. For driving directions and other details, call 704-527-4223. Boyles Furniture in Mocksville (near Greensboro) has 16 factory outlet stores to explore. Call 888-848-4551 for details. Broyhill Factory Outlet is located in Hickory (near Charlotte). Call 828-758-8899 for details. Coffey Furniture in Granite Falls (near Charlotte) has 40 factory outlet stores. ﻿Call 828-396-2900 for details. 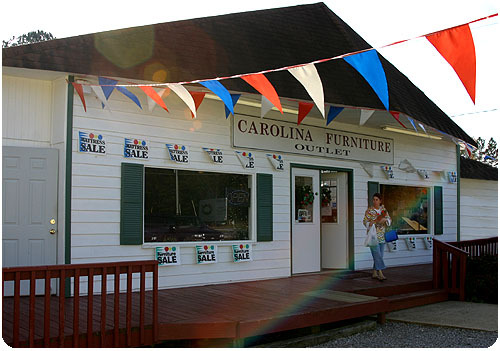 Colfax Furniture has two outlet locations, one in Kernersville (near Greensboro), and one in Winston-Salem. Each outlet mall has 20 factory outlet stores. ﻿For details, call 336-855-0498 (Greensboro) or 336-499-0915 (Winston-Salem). Concord Mills in Concord (near Charlotte) has 132 factory outlet stores. ﻿Call 704-979-5000 for details. Contempo Concepts in Winston-Salem (near Greensboro) has 23 factory outlet stores. ﻿Call 336-723-1717 for details. Dare Centre in Kill Devil Hills (near Greenville) has 3 factory outlet stores - Belk, Dollar Tree, and Rack Room Shoes. ﻿Call 757-488-9639 for details. Decorator's Choice in Jamestown (near Greensboro) has 5 factory outlet stores. ﻿Call 336-883-6104 for details. Drexel Heritage in Jamestown (near Greensboro) has its own factory outlet store. ﻿Call 336-883-1800 for details. Elite Designs in Jamestown (near Greensboro) has 8 factory outlet stores. ﻿Call 336-885-1333 for details. Ellenburg's Furniture in Statesville (near Charlotte) has 49 factory outlet stores. ﻿Call 704-873-2900 for details. Furnitureland South in Jamestown (near Greensboro) has 352 factory outlet stores. ﻿Furnitureland carries the largest collection of Antique Furniture Stores in all of North Carolina. Call 336-841-4328 for details. High Point Furniture Sales in High Point (near Greensboro) has 92 outlet stores, including quite a few Antique Furniture Stores. For more info, call 336-841-5664. High Point Home Furnishings Center in High Point (near Greensboro) has 3 outlet stores. For more info, call 336-887-7477. Homeway Furniture in Mount Airy (near Charlotte) has 97 outlet stores. For more info, call 336-786-6151. Studio 70 in Hickory (near Charlotte) has 28 outlet stores. For more info, call 828-322-2800. Theodore Alexander Factory Outlet in High Point (near Greensboro) has 2 outlet stores. For more info, call 336-884-0285.